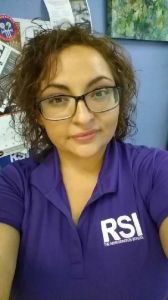 Born and raised in Phoenix, AZ, Erica, a single mom of six, including infant twins, joined RSI as a career services advisor in October 2018. Thanks for your time, Erica. How long have you worked in education? I actually started in education in 2006. I worked at Grand Canyon University as an academic advisor for about six years before I moved to Universal Technical Institute in 2012. That’s where I first got into career services. I was there for four years before I moved into recruitment for an automotive collision company. I was the regional recruiter for the western states so I traveled a lot. I did that until I was 33 weeks pregnant. From July 2017 until the New Year, I took time off to have twins. I already had four children, but having two more at the same time was a lot to handle on my own! I can only imagine! So you went back to work in January 2018? They wanted me back at my old job, but I couldn’t do the traveling. I decided to go back to education, and career services in particular. I worked at College America. It was a different area for me, more medical and computers than trades. I enjoyed it, but the chemistry just wasn’t right. I didn’t feel like I was at home, so I started looking for something else. That’s when I found RSI. It’s only been a couple of months, but I love it here! What was it about career services that appealed? Being a part of a student’s journey from start to finish is what brought me back to career services. Some fresh out of high school, others looking for a career change, or those looking for certification in their field. I enjoy seeing you go through the program, watching your progress, being part of your graduation process, and helping you start a career. Could you outline what a career services advisor does for RSI students? The first thing we do is help prepare you for job interviews. We offer résumé workshops that are built into your class schedule. You have the chance to work with me or my colleague to help build your résumé. We also do mock interviews, panel interviews where we ask industry questions and general “why should we choose you?” kinds of questions. We try to get you prepared for what someone in the field will ask at a real interview. It’s often those questions that people get stuck on—the easy questions that you should know, but sometimes just can’t put into words. And you help with their job search of course? Midway through the program, we start reaching out to ask, what’s your ideal company? Who do you want to work for? Are you interested in companies out of state? Do you have companies in mind here in Arizona? These are the target companies that I’m going to look at, that I’m going to reach out to, to try to build relationships with. By the time you’re ready to graduate, my goal is to have something set up for you. Whether it’s an interview before you graduate, or whether the company is coming to campus and meet with you. But that’s my desired outcome. That’s what I work toward—to get you where you want to be. What happens if that plan doesn’t work out? If you don’t have something set in stone by graduation, we reach out once a week by phone, text or email, or you can come and see us. We have the resource center where you can use the computers to search and apply for jobs. We walk you through the application process for those job opportunities. Do RSI graduates have access to your team? We are definitely available for graduates. This is a lifetime relationship with RSI. Even if you have a job set up when you leave, and a year or two down the road something happens or you want to try something new, we will help you. We are always available for any student that successfully completes our programs—whether that’s three, five, or ten years from now. How many people are in the career services team at RSI? Three. Our director Rick White, myself and Joanna. Our office is open 8 a.m. to 7 p.m. You can come in any time to see any of us. We work with students from all our programs: HVAC, welding, electrical, refrigeration. When does a student first meet your team? We introduce ourselves during your first phase, typically in the second week. We encourage you to start thinking about your career early. We definitely like to build a relationship right off the bat. Coming to us is not something you should wait to do. We like you to know all the services that we have available. We are the ones who will help you find a job and get started in your career. Help with résumés and completing job applications online. Those are things I get asked a lot. They sometimes ask, “Am I supposed to be honest?” when completing an application. Yes, yes, you are! Just communicate with me. I’m here to help. That’s my job. I’m here to help you start your career. Let me know what your situation is, if you are struggling or doing well. Be open with me. There’s no judgment here, so let me know what’s going on. It’s a young lady who graduated the Electro-Mechanical Technologies program before I joined. She wasn’t placed before graduation, so I reached out to her. It took a while for her to respond, about a week, but once she came back to me, we got to know each other a little. Being in the field as a woman, she was kind of iffy about it all, to be honest. But she wanted to work with this company that she’d seen a job posting for, so I reached out on her behalf. They asked her to come in and she absolutely killed the interview! They loved her right from the jump. They reached back out as soon as they were done and said they wanted her! It worked out perfectly for her. She is working at Talking Stick Arena with the Phoenix Suns. She does work with a lot of men, but she says that they just treat her as one of the guys. They never hesitate to give her a job because they don’t think she’ll be able to handle it. Just seeing the expression on her face when she got the job, and knowing I had a part in it, that is what I enjoy! I felt really good about helping her. If you want a rewarding, stable career and to be able to provide for your family, this is definitely a road that you want to take. If this is your goal, a trade that you can see yourself doing, do it. But once you get here, be sure to take advantage of everything, all the resources available to you, right from the start.